The map shows the number of electoral votes by state, one vote per square. The states colored green are participants in a gambit that would, if successful, vitiate the Electoral College (EC). They hope to execute an end-run around Article V of the Constitution, which otherwise would require an amendment to replace the EC with the national popular vote. Such an amendment is highly unlikely to win approval, as I noted last week. 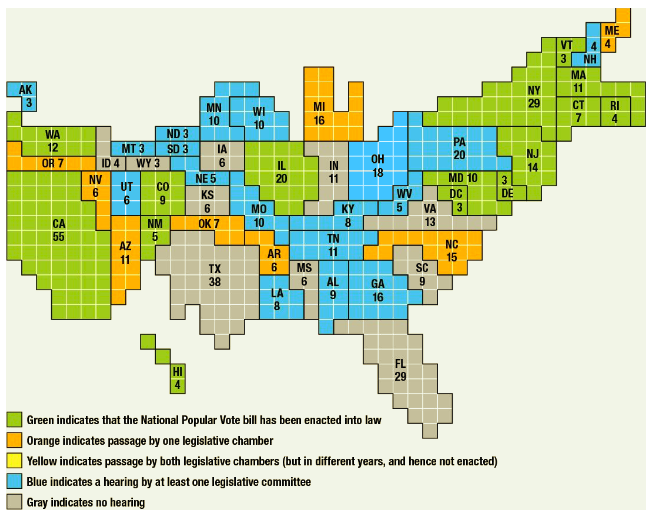 The green states are members of the so-called National Popular Vote Interstate Compact (NPVC). This group of 13 states plus the District of Columbia would pledge their electors to the winner of the national popular vote, but only if and when enough states join the Compact to enable it to carry an election. The big question is whether an electoral action by the NPVC would be constitutional. Article I, Section 10 of the Constitution prohibits states from entering treaties or compacts with other states without the approval of Congress. However, supporters of the NPV such as Justin Yang focus on an 1893 Supreme Court decision (Virginia v. Tennessee) that found congressional approval is unnecessary as long as a compact does not infringe on federal powers. NPVC advocates go on to assert that elsewhere, in Article II, Section 1, state legislatures are empowered to allocate electoral votes “in any way they want“, as Yang puts it. There are strong reasons to doubt the NPVC’s interpretation, however. Carroll Andrew Morse raises a basic constitutional issue: the NPVC amounts to a denial of voting rights to the citizens of a Compact member-state. It is obviously true that a member-state’s voters would contribute to the national vote totals. Nevertheless, awarding state electors to the winner of the national vote, regardless of the in-state outcome, certainly could deprive state residents of their preference. The Fourteenth Amendment provides that a state’s denial of voting rights to any citizen or group of citizens would require the state to relinquish its representation in the legislature by a proportionate amount. That is a harsh remedy that the voters of any state should consider when weighing the benefits of membership in the NPVC. Williams cites a 1995 Supreme Court decision (U.S. Term Limits, Inc. v. Thornton) limiting state power over questions such as congressional term limits. The ruling stated that state-regulated limits create additional qualifications for holding office that are not authorized under the Elections Clause in Article I, Section 4. Williams contends that the process of choosing electors is analogous to other provisions regarding state powers, so it should be subject to the same limitations. He also says that if the Court followed the same method of reasoning as in Thornton, which focused on the founders intent as well as subsequent developments, it would reject the actions of the NPVC as unconstitutional. Any legal challenge to the NPVC will have to wait until it is effective, that is, when and if it ever exercises 270 electoral votes. It now has a total of 189 electoral votes. The most recent addition was New Mexico, and a proposed ballot measure in Ohio could bring total Compact electors to 207. Fans of the NPVC hope that Michigan, Minnesota, and Wisconsin might join as well, though none of those is imminent. But if they did it would bring another 46 electoral votes to the Compact. Apparently Pennsylvania has rejected membership for now. Almost all of the states already in the NPVC are solidly “blue”, having voted for the Democrat in presidential elections, at least over recent cycles. Of course, that means the Compact might quickly disintegrate if a Republican is expected to win the popular vote. Right now, however, Colorado and New Mexico are the only states that might qualify as swing states, and even those are a stretch. Some of the other states in which the NPVC is under debate are legitimate swing states, and legislation enabling the change will be risky for many lawmakers in those states. Ballot measures might be more preferable to the NPVC due to the possibility of limited turnout. We’ll see how it goes. If states with 270 or more electors vote as a block, it diminishes the importance of each state’s voters, who might well disagree with the national popular vote in the future if not already. For example, members of the NPVC, including California, would have had to cast their electoral votes for George W. Bush in 2004, despite the desires expressed by their citizens at the polls. Voters at-large in any non-Compact state have more leverage over the outcome of a presidential election than if they follow the national popular vote. Alexander Hamilton would not have approved of the NPVC; he wrote that a state’s electors should not be influenced by parties outside the state. That was the intent of the founders. Court challenges would undoubtedly follow any exercise of votes through the NPVC. Presumably that would occur only in the event of another conflict between the national popular vote and the EC, as constituted prior to the adoption of the NPVC. That would occur only if at least one Compact state had an in-state popular vote conflicting with the national vote. There is almost no doubt that such a dispute would make its way to the Supreme Court. Thus, a presidential election might someday be undecided until a final ruling is passed down by the high court. I strongly suspect that the NPVC would be found unconstitutional.